Perhaps it was just the thrill of knowing that I would be off the hook in the watering-of-the-lawn-and-plants obligations that fall to me when my husband is out of town. With his travels taking him away from home for the better part of the next two weeks, that small, but imperative task gets added to my daily to-do list. And perhaps it was partly because I see multiple days on the forecast featuring triple digit temps just ahead. And then again, maybe it was just because rain in July in Oklahoma is always a great sign of God’s merciful provision to us. 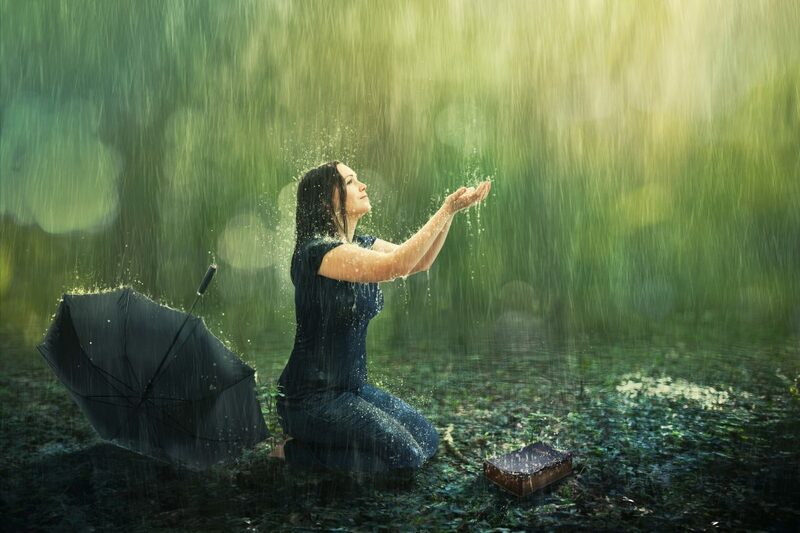 But tonight after the kids were tucked away in bed and I lathered my face with suds, washing away the wear and tear of the day, I began to think about the rain’s parallel to the sweet presence of the Holy Spirit. Lately I find myself craving the rain of His presence often, almost hourly. And I’m craving it all the more because I find myself in need of it. You know how you’ll go through a season where you are nearly drowning in His presence? You sense the closeness of the Spirit everywhere you turn. It’s almost an overwhelming love fest, just you and Him, everywhere you go? And then there are pockets of life where, despite your search for Him, you know He’s there, but you just can’t feel that gentle embrace you are almost salivating for. Or maybe in response to the lack of sensing that drenching, you back away, almost frustrated in the quest. Just like I wrestled with the hiding or the soaking, my spirit often wrestles. Do I back up, knowing what I know about Him and trusting His hand to guide me through the dry places? Or do I keep climbing back into my prayer closet, double-daring His Spirit to bring along a flash flood? Like David I am saying tonight: Lord, I thirst for You as parched land thirst for rain. Friends, dry days are in the forecast. We have yet to arrive to the New Heaven where the river of God runs freely and fully. Therefore, our hearts must pant for still waters, longing for His presence and being willing to wait for it to be fully manifested. What storm do you find yourself in? Soak up the rain. Find shelter under His wings. And take refuge in the Spirit’s care as He delights to shower us with all that we need and so much more.